Porches and Pies Seeks Community Sponsors! 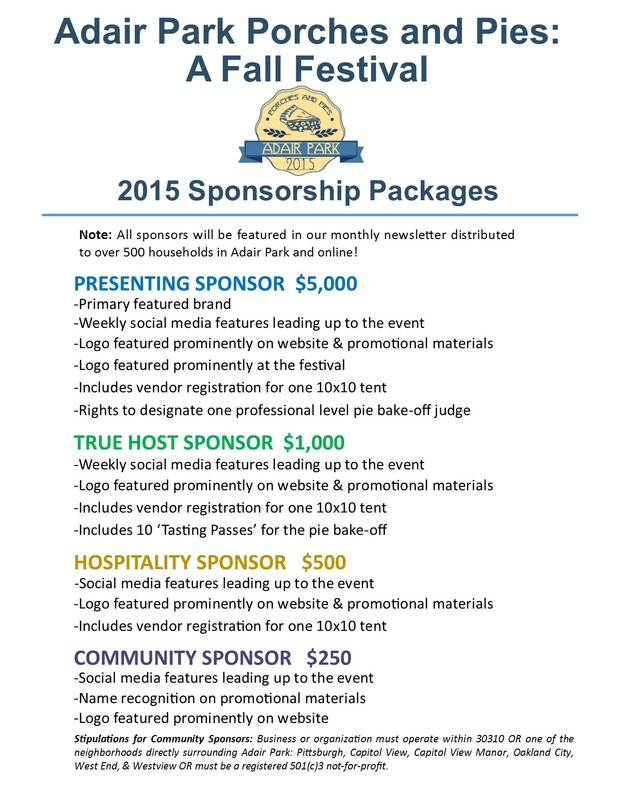 You can mail in the sponsorship form with your check or fill it out online by clicking here. Thank you to the amazing sponsors who have already signed up to support this community-building event! CA$H Mob at Bakari’s Pizza July 9-12! Patronize Bakari’s Pizza (576 Lee St, SW, Atlanta, GA 30310) between July 9th-12th (Thursday-Sunday). The official Cash Mob Meet-Up will be on Friday, July 10th, 6pm-8pm. Show up and get a FREE Cash Mob Sticker! The Georgia Department of Transportation (GDOT) is proposed changes to the intersection of I-20, Northside Drive and Whitehall. The survey is at the end of the document below, and responses can either go to Adair Park President, Randy Gibbs at mrgibbs63@gmail.com or directly to: mrobinson@dot.ga.gov and megha_young@gspnet.com. NPU-V Communities of Atlanta host National Night Out Community Block Party! All are invited to this Community Block Party which promotes community pride and community safety! Fun for the ENTIRE family!Free Food and Free Give-A-Ways! For more information and/or to participate, please contact Watrina Watson at (404)-254-8221 or watrina.watson@gmail.com. PNC Donates 6 Lending Libraries to Adair Park! Thanks to a generous donation by PNC Bank to Friends of Adair Park we are receiving 6 little lending libraries for the neighborhood! During the Mayor’s Summer Reading Club Event in AP 2 on 6/13/15 children will have an opportunity to decorate and add a personal touch to the libraries. The libraries will then be installed throughout Adair Park! If you can donate paint, books, or installation expertise, please contact secretary@adairpark.com. “More little lending libraries are popping up around metro Atlanta this month as Friends of Adair Park gets set to install six of the miniature book exchanges throughout its neighborhood parks and public space.